The report on BEPS Action 14 (Making Dispute Resolution Mechanisms More Effective) contains a commitment by jurisdictions to implement a minimum standard to ensure that they resolve treaty-related disputes in a timely, effective and efficient manner. All members of the Inclusive Framework on BEPS (IF) commit to the implementation of the Action 14 minimum standard which includes timely and complete reporting of mutual agreement procedure (MAP) statistics pursuant to an agreed reporting framework. The 2017 MAP statistics are reported under this new framework. They cover all the members that joined the IF prior to 2018. 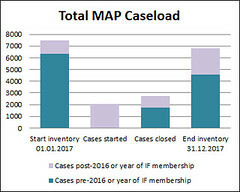 * New cases (cases received on or after 1 January 2016 or 1 January of the year of joining the BEPS Inclusive Framework) are counted using an agreed methodology that uses a common start date and allows for reconciliation of all MAP cases between members of the Inclusive Framework thus eliminating double counting. Old cases (cases received prior to 1 January 2016 or 1 January of the year of joining the BEPS Inclusive Framework) were based on each reporting jurisdictions’ own methodology without a jurisdiction by jurisdiction breakdown and the possibility of reconciliation. Aggregate reporting for old cases therefore included double counting of cases reported by two reporting jurisdictions in their respective inventory. 2017 MAP statistics are also available per reporting jurisdiction. See the table that summarises all the 2017 MAP caseload per jurisdiction where the specific file for each jurisdiction can be downloaded by clicking on a jurisdiction’s name. See also the graph that presents the evolution of MAP inventory per jurisdiction. In the MAP Statistics Reporting Framework, a distinction is made between the cases received before or as from 1 January 2016, which is the date as from when the reporting jurisdictions committed to the implementation of the Action 14 minimum standard. For the jurisdictions that joined the inclusive framework after 31 December 2016, the distinction is made between the cases received before or as from 1 January of the year of joining the Inclusive Framework on BEPS (IF membership). 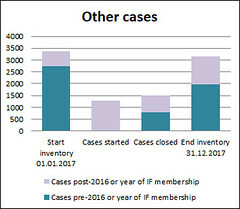 The cases received before 1 January 2016 or 1 January of the year of joining the Inclusive Framework on BEPS (IF membership) are cases that were in the inventory of the jurisdictions before they committed to the implementation of the Action 14 minimum standard. The number of cases in such category will decrease over time. The cases received as from 1 January 2016 or 1 January of the year of joining the Inclusive Framework on BEPS (IF membership) are cases that started after the jurisdictions committed to the implementation of the Action 14 minimum standard. The share of cases in such category will increase over time and eventually will cover all cases in a jurisdiction’s inventory. The agreed reporting framework now makes a distinction between "attribution/allocation" cases and "other" cases. 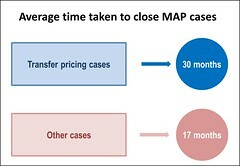 Any MAP case that is not an attribution / allocation MAP case is considered as an "other" MAP case. Note: while these definitions belong to the set of rules applicable for cases started as from 1 January 2016 or 1 January of the year of joining the BEPS Inclusive Framework (IF membership), the jurisdictions may have used different definitions for cases that started before 1 January 2016 and specify in the notes of their own statistics the definitions they have used. 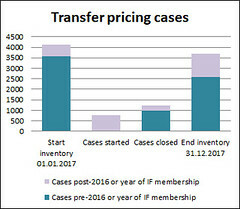 See also above for more details about the distinction between cases started before or as from 1 January 2016 or 1 January of the year of joining the BEPS Inclusive Framework (IF membership). Note: the average time mentioned here only relates to cases that were closed in 2017. For cases started as from 1 January 2016, this means that maximum 24 months have elapsed from the start date to the end date of such cases. More information on average time and computation rules. MAP statistics for reporting periods 2006 to 2015 and for 2016 are still available for OECD member countries and a number of non-OECD economies that have agreed to provide such statistics for these periods.